Seung Sahn Dae Soen Sa was in the first wave of Korean Zen Masters to teach in the West. While not the first Korean Master to live and teach in the west (The first Korean Zen teacher to live and teach in the West was Samu Soensa who established his first western Zen Center in 1969, which was three years before Zen Master Sungsan arrived in America), he was responsible for establishing one of the largest Korean Son (Zen) organizations in the west, the Kwan Um School of Zen. Zen Master Seung Sahn was born in Korea in 1927 during the Japanese occupation, which he resisted during his youth. After World War II, disillusioned with politics and academic studies as a way to attain truth, he went to the mountains with the goal of finding his true self. At that time he did an arduous 100-day chanting retreat, during which he attained enlightenment. Afterwards his attainment was recognized by several Korean Masters, and he received Inga from Zen Master Kobong, an enigmatic Zen Master who refused to teach monks. Kobong Sunim told him, "Your Dharma mission is the whole world." In subsequent years, Daejongsanim worked to reorganize Korean Buddhism, then he left Korea for Japan, where he spent seven years, founding temples and teaching Zen. Daejongsanim arrived in the United States in 1972 with the idea of seeing whether it was possible to teach Zen to Westerners. He had little money and no English. After spending a short time with the Korean community in Los Angeles, he went to Providence, Rhode Island where he took a job in a Laundromat, carrying laundry and repairing the machines. He met a professor of Buddhism from Brown University who introduced Daejongsanim to some of his students. They would come by Daejongsanim's small, slum apartment; Daejongsanim would cook for them, teach them meditation, and answer their questions about Zen practice and life. With his new students' help, Daejongsanim subsequently founded the Providence Zen Center, a large, residential Zen Center that has become the head temple to The Kwan Um School of Zen and more than five dozen Zen Centers around the world, including Dharma Zen Center in Los Angeles. Daejongsanim had given Dharma Transmission to several of his Western students and Inga to some fourteen others. Daejongsanim authored a number of books, notably the Zen classic, Dropping Ashes on the Buddha (Grove Press) and, recently, a collection of Zen, Christian and Taoist kong’ans, The Whole World Is a Single Flower (Tuttle) and The Compass of Zen (Shambhala). Daejongsanim had always encouraged people of all faiths to realize their true nature together. For many years he has lead Zen retreats at the Abbey of Gethsemani and taught at several Ecumenical gatherings. 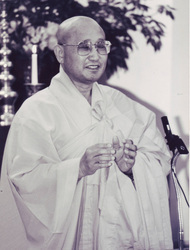 The Venerable Dr. Thích Thiên-Ân (September 1926 - November 1980) came to the United States from Vietnam in the summer of 1966 as an exchange professor. He taught philosophy at the University of California, Los Angeles. After discovering that he was not only a renowned scholar, but a Zen Buddhist monk, as well, his students convinced him to teach Zen meditation and to start a Buddhist study group on the UCLA campus. Once established, Thích Thiên-Ân taught the traditions of Zen Buddhism at his center. In addition, he taught Eastern Philosophy and Asian Studies at Los Angeles City College. He retired from teaching at the college when he was diagnosed with liver cancer 1979. He continued teaching at his center until he died in 1980 at the age of 54, succumbing to the effects of the liver cancer.